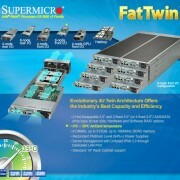 Supermicro TwinBlade Offers 2,880 CPU Cores per Rack – Throughwave (Thailand) Co.,Ltd. SAN JOSE, Calif., November 12, 2010 – Super Micro Computer, Inc. (NASDAQ: SMCI), the global leader in server technology innovation and green computing, today announced the launch of two new AMD OpteronTM 6100 Series processor-based SuperBlade® modules, which the company will demonstrate at SuperComputing 2010, November 15-18 in New Orleans, Louisiana at the Ernest N. Morial Convention Center, booth 3829. Supermicro is introducing a new TwinBlade™and a new 4-way blade, and both modules are optimized to support the latest 12-core AMD OpteronTM 6100 Series (Socket G34) processors for up 2,880 CPU cores in a standard 42U rack. 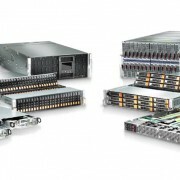 As the latest addition to Supermicro’s SuperBlade® family, the innovative TwinBlade™ doubles the number of dual-processor (DP) compute nodes per 7U enclosure to 20. Based on the SBA-7222G-T2 blade supporting the latest AMD OpteronTM 6100 Series processors this system delivers incredible performance-per-dollar and performance-per-square-foot. Available with dual 40Gb/s QDR InfiniBand switches, this optimized blade solution combines industry-leading 94% power supply efficiency with Supermicro’s innovative and highly efficient thermal and cooling system designs to deliver exceptional system performance-per-watt, making it an exceptionally green, and power-efficient server solution for customers. When powered by new 12-core AMD Opteron 6100 Series (Socket G34) processors, the TwinBlade™ enables up to 2,880 processing cores, 240 SATA drives and 15TB of DDR3 memory per 42U rack. Featuring dual 40Gb/s InfiniBand, FCoE or 10GbE switches and dual 1/10GbE switches in one 7U enclosure, TwinBlade™ provides the highest performing I/O throughput and scalability in the industry and is a superb solution for high-performance computing (HPC), datacenter, enterprise and cloud computing deployments. With successful installations at CERN, PRACE, and other Fortune 100 organizations, the SuperBlade® has already become the preferred solution for a wide range of mission-critical applications. Supermicro’s enterprise-class SuperBlade® features quad-processor blades for maximum density, performance, scalability and flexibility. With up to 10 four-socket server blades within a single 7U enclosure, this new 4-way SuperBlade® SBA-7142G-T4 also supports up to 2,880 AMD OpteronTM processor cores, 240 SATA drives and 15TB of DDR3 memory per 42U rack. Supermicro, Server Building Block Solution, and SuperBlade are registered trademarks and TwinBlade and Double-sided Storage are trademarks of Super Micro Computer, Inc. AMD, the AMD Arrow logo, AMD Opteron and combinations thereof, are trademarks of Advanced Micro Devices, Inc. All other trademarks are the property of their respective owners.